Gallagher Chiefs loose forward and co-captain Sam Cane will become the latest Chiefs centurion when he runs out against the Highlanders in Hamilton on Friday evening. 26-year old Cane has been named to start the eagerly-anticipated New Zealand derby match at FMG Stadium Waikato and will become just the seventh Chiefs player to reach the special milestone, joining Mils Muliana, Liam Messam, Tanerau Latimer, Hikawera Elliot, Aaron Cruden and Stephen Donald. Sam made his debut for the Gallagher Chiefs against the Lions in Johannesburg in 2011, and was part of the back-to-back winning squad who won Investec Super Rugby titles in 2012 and 2013. The loose forward became co-captain of the squad in 2016 with Aaron Cruden and has grown from strength to strength both with on-field performance and the leadership he brings to the team. Head Coach Colin Cooper was delighted to see Sam reach this significant milestone. Sam Cane commented on his time so far at the Chiefs and what the club mean to him. Cane again picked up the Co-Captain duties for the 2018 season, alongside Charlie Ngatai and has started every game so far of the campaign. Known for his relentless work ethic and tenacity at the breakdown, Cane has played over 53 test matches for the All Blacks, captaining the side on numerous occasions. He is also part of the All Blacks leadership group. Following Friday’s match, New Zealand Rugby will present Cane with a pounamu mere, the traditional NZR gift for players who play 100 Super Rugby games for New Zealand sides. 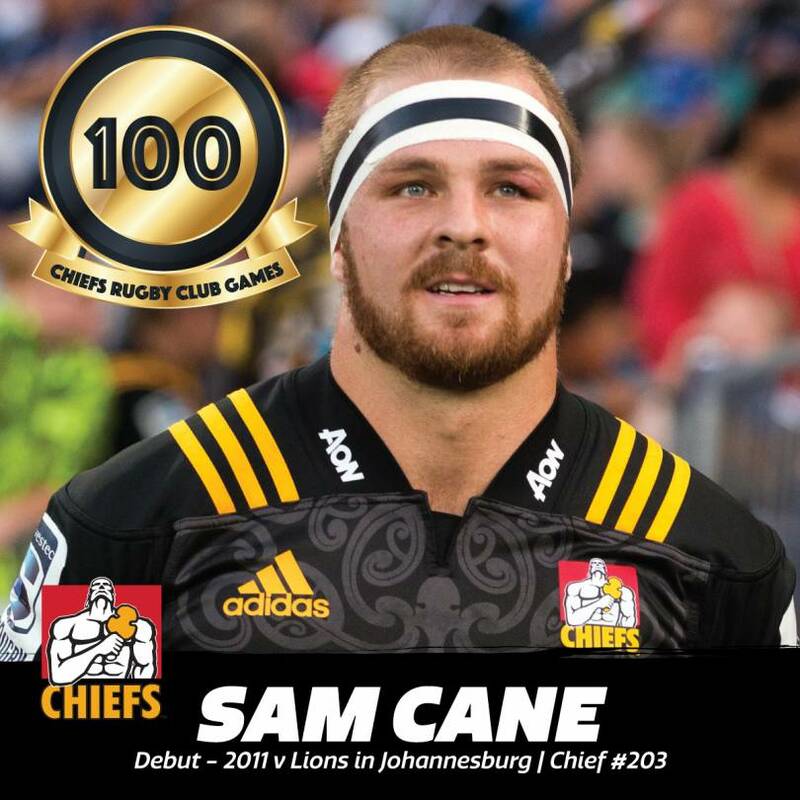 We will be celebrating Sam as he makes this significant milestone, so make sure you get on down to FMG Stadium Waikato to support a true Chiefs Country legend.